Buy sugar bowls at the offical WMF online shop. The handy sugar bowls from WMF impress thanks to their sleek design, ease of use and optimal dosing for all kinds of sugar. Hot drinks are an integral part of modern life for both children and adults. Coffee, tea, hot chocolate - every drink has its fans. Individual taste is always paramount - especially when it comes to how sweet it should be! Some like their coffee black and sweet, while others prefer to enjoy their tea 'unspoilt'. For some, hot chocolate can't be sweet enough! With WMF's sugar bowls, everyone can decide on their own level of sweetness to match their own personal taste. They are the ideal accessory to have on the table to ensure sugar can be dosed quickly and easily - at breakfast, lunch and dinner. Whenever you and your guests need an extra kick of sugar, these practical bowls are just what you need.  WMF attaches particular importance to an attractive design, combined with unique functions and ease of use. With sugar bowls, for example, it's particularly important that the container can be filled easily. The sugar should end up in the bowl, not all over the worktop. That's why WMF sugar bowls have particularly large openings. Filling them is very easy, whether it's with cubes or granulated sugar. At the same time, the sugar is very easy to remove with either tongs or a spoon. All variants offer you sufficient space. In this category, you'll find various models of high-quality WMF sugar bowls. Some of the cleverly designed models can also be purchased in stylish sets, for example combined with the matching creamer. With their attractive designs, they fit in perfectly with your own personal style and enrich any table. Their small, handy shape is a particularly practical aspect of each sugar bowl. This means they can be put on the table in no time, and tidied away just as quickly when no longer needed. Order your WMF sugar bowl now and make the most of our unique offers!